Gordianus, his radiate, draped and cuirassed bust right. holding transverse spear and globe. Mattingley, Sydenham, & Sutherland, "Roman Imperial Coinage", Volume 4, Part 3 (RIC), p25, nr 93. Sear, D.R., "Roman Coins and their Values" (RCV Millennium Edition), Vol. 3, p121, nr. 8650. Sear, D.R., "Roman Coins and their Values" (RCV 4th Revised Edition), p235, nr. 2454. Cohen, H, "Descriptions Historique des Monnaies frappees sous l'Empire Romain" (C), Volume 5, p48, nr. 266. Seaby, H.A. 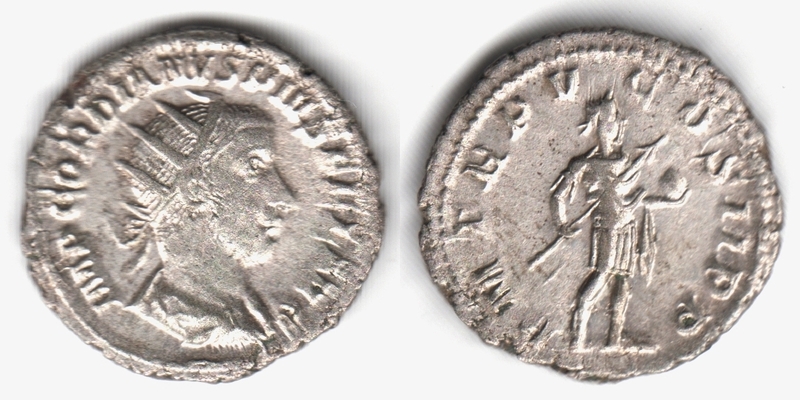 & Sear, D.R., "Roman Silver Coins" (RSC), Volume 4, p7, nr. 266. Van Meter, D., "Handbook of Roman Imperial Coins" (VM), p224, nr. 40/3. Kampmann, U., "Die Münzen der römischen Kaiserzeit", 2nd edition, (Kampmann) p279, nr. 72.39.3.